This situation has some prominent Mac users up in arms. Forum posts have been popping up at various locations since Mojave’s release and last month, a petition that currently has over 2,800 signatures landed on Change.Org urging Apple and Tim Cook to work with NVIDIA. So.. been having lots of fun with Windows 7 this morning. Got hold of a refurb PC for doing some client system testing. Win7 install completes and there are 3 updates to do. Start the update process and two modal windows open up behind the update window, waiting for me to do something. 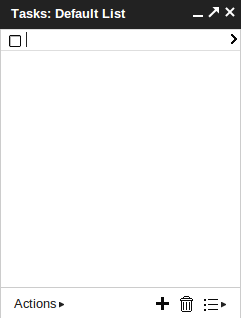 Have to click on task bar’s flashing icon to bring windows to the front. On Windows. Windows. With 20 minutes of Windows use this morning, I can’t believe just how bad things are on the other side of the fence. Someone fresh to Windows will see all this flashing icons, hidden windows, alerts, worries… and not have the first clue what to do. Someone close to me was one of those unfortunate souls. She’d persisted for about a year with her Win7 machine and was constantly anxious with its scaremongering. Hardly a productive environment. Luckily, she’s now running #debian #wheezy with the #gnomeshell and immediately found it intuitive and straightforward. Go #freesoftware !! Strong headline maybe, but if you’re not on Google+ then you might consider your stance after reading this. 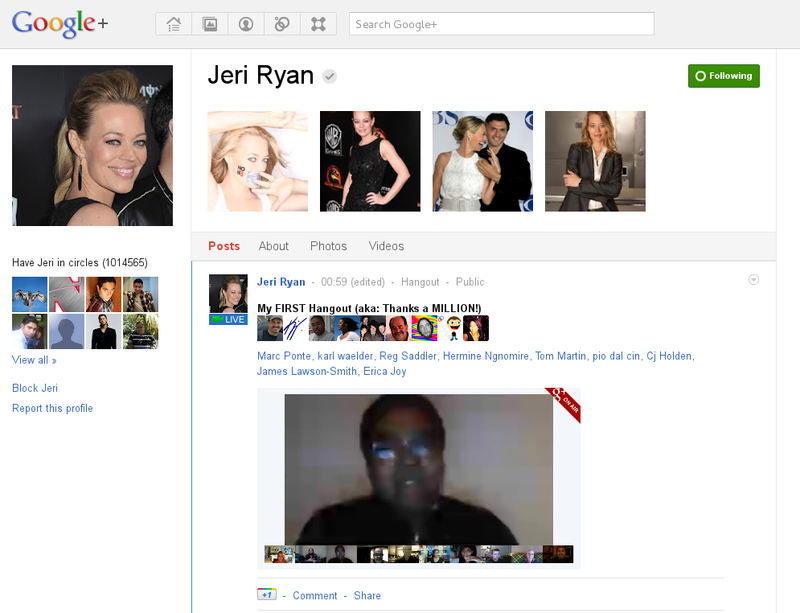 Jeri Ryan, best known as borg escapee “Seven of Nine” in Star Trek:Voyager, hosted a Hangout today on Google+, in celebration of having over 1 million fans subscribing to her feed. There was a lot of buzz around it, with hundreds of comments flying around under the Hangout post, updating in real time. It was pretty hard to get a video stream from Google, such were the number of simultaneous subscriptions. In many ways, this reminded me of the excitement of the early internet, where we learned about things such as bandwidth… The kids today, they have everything! Still, the excitement wasn’t only in the new broadcast/interaction (intercast?!) method through G+ hangouts, it was the realisation that, should they choose, celebs can now use a nice, safe way of engaging with their fan base. Directly. Over time, this may disarm broadcast controllers and empower people, be they celebrities or fans, into collaboration through constructive, enriching dialogue. Wil Wheaton, self-confessed geek and well-known actor likewise, was notably impressed with hangouts. It was refreshing to see people observing great netiquette while chatting with Jeri. How much more enjoyable, this, than suffering typically mundane updates as you might in another social networking system. As Google measures and expands upon functionality in G+, I hope they’ll see fit to bring more interactive tools to the table. I get the feeling that hangouts are just the start of the next revolution. As Android gathers increasing momentum and Google+ apps appear on both major mobile platforms, we could see real-time social networking emerge as the number one communication method. People, known and unknown to each other, will communicate, partly in mimicry, utilising all tools at their disposal. And, with open source platforms gathering adoption, they will inevitably add both their biological and technological distinctiveness to our own. Resistance, my friends, is futile.